Last weekend the Excel center in London’s grey and shiny Docklands saw the second London Super Comic Con. It was a huge and storied affair, and at one time or another every one of your loyal monkeys was in attendance, as well as many friends of the site. James and I were actually volunteers at the event, which he’ll be telling you about in another post. Because of the size of the con, and because of our unprecedented monkey saturation of it, we thought we’d try and get a few different viewpoints of it. We’ve also got Stephen Lacey – of the 20 Minute Longbox podcast, as well as our own Substitute Monkeys – in our third and final post about the show. 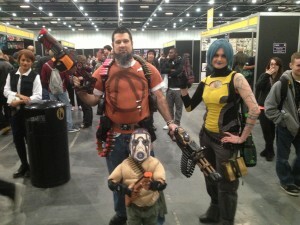 How did LSCC look to a visitor (albeit a slightly more geeky and monkey-esque one)? 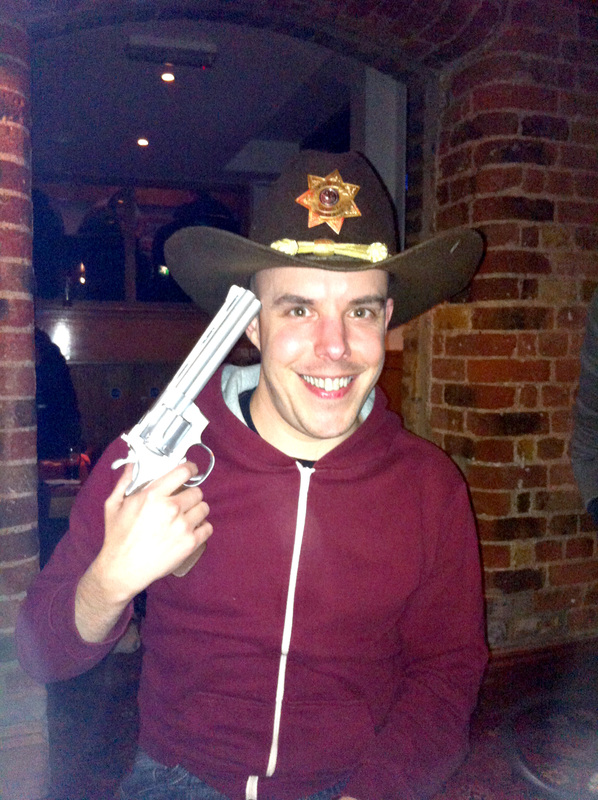 So last weekend rolled into town and with it (if that town was London) came the London Super Comic Con. Though the weather outside was frightful, the punters inside were delightful as they descended upon the ExCel to look at comics, buy comics, talk about comics, listen to other people talk about comics and of course dress like comics (or the characters contained therein at any rate). Why? Because comics, that’s why! Among the punters, disguised in our cosplay as characters from the background of Elemental Micah #5, were Ginger Millie and I, in London to celebrate the pretty lady’s birthday. Being that it was a first for both of us – it was her first convention and my first time at LSCC – we took a short while to acclimatise ourselves to the surroundings. On first glance the convention hall seemed kind of empty. It was only after the first of many walks around the convention hall (I wish I’d taken a pedometer!) that I realised there was still a huge amount of stuff to look at and, obviously, a huge amount of stuff to buy. Enough stuff in fact that I left the con at the end of the day with one major complaint; I really wish I’d taken a bigger bag. The thing I’ve always liked most about conventions is that even when you’ve found all the things you wanted, a number of things you didn’t realise you wanted, and you’ve remortgaged your house to buy those one of a kind trainers with video screens in (or shelled out for a pasty from the stall just outside – take your pick! ), there’s still a lot to see. Having inadvertently missed the 50 years of Marvel panel due to being too busy saying hello to people we knew, Ginger Millie and I opted to sit in on the Daredevil panel attended by the legendary David Mack, Klaus Janson and Bill Sienkiewicz. While the panel wasn’t quite as in depth as I hoped- if there’s one thing I love more than the stories in comics, it’s the stories behind comics – it was still a huge buzz to see three luminaries of the trade up on stage together discussing one of its most interesting characters. There was also no end to the entertaining cosplays throughout the day. Be it the Gingerbread Punisher & Wonder Woman wandering around with Sully from Monsters Inc, the Borderlands family or any number of Batmen from different eras, there was no end to the range of costumes on display or the talent that had clearly gone into making some of them. There was even a guy in an Amazing Spider-Man outfit that looked better than the one from the movie! At the end of a long day though the best thing I got to do was spend an evening – that felt all too short – in the company of the people I knew already or had met that day. If I saw you that evening (or on the Sunday evening when we went back to meet the other monkeys) then be assured that you contributed to one of the loveliest evenings I’ve had out in a very long time and you rock considerably. I would list all the names but I’d inevitably leave someone important out. I should give a shout out in particular though to Gibson, who introduced me to Geoff Senior, an artist whose work I have admired for the best part of twenty years. I was eleven all over again, and star struck as hell. How was the convention for a publisher? Sitting here suffering from the post-LSCC plague that appears to have infected most of the UK comics industry in the wake of last weekend’s festivities, it’s hard to put into perspective what an amazing weekend it actually was. While it might be interesting to analyse the effects of introducing a virulent virus into a confined space, that’s not going to be the main thrust of what I write here. I’ve been asked to talk about the London Super Comic Convention from a publisher’s perspective, rather than a plague sufferer’s perspective, and that’s what I’ll do! So what was LSCC like for a relatively small UK based indie publisher like Orang Utan Comics? Well, you remember that bit from the Duck Tales intro when Uncle Scrooge dives into his huge pile of money and starts swimming around in it? It was a little like that. I say “a little” because, in the grand scheme of things the amount of money we made wasn’t vast (it was just about enough to cover the print costs for all the new books we had printed for the show and the various coming shows), but it was considerably more than we’ve ever taken at any show ever before. The great thing about LSCC is that it’s our audience. Over the years the creators at OUC have developed a reputation for not only doing indie super heroes, but doing them well. When we started out the conventional wisdom was that there’s no point doing super heroes because Marvel and DC have that audience sewn up. We tried doing other things, it never really worked…but every time we do super heroes it just seems to click. And why shouldn’t it? Look at some of the finest writers in super hero comics – Alan Moore, Warren Ellis, Kieron Gillen, to name just a few. The British know how to write super heroes. So, for us, a convention that appeals to the super hero loving comic reader by having a ton of mainstream super hero writers and artists as guests – and also appeals to indie comics readers by having the likes of Avatar, Zenoscope and Top Cow exhibiting – is absolutely perfect. It draws in people who love super heroes and who aren’t afraid to read something that’s not published by the big two. Add to this the fact that having a booth put us on an equal footing with the likes of 2000AD in the average punters eyes and it saw a lot more people willing to look at our books than at other shows. And once they’d picked them up… how could they resist buying them? The London Super Comic Con is the closest thing the UK has to a US style con, and I for one would love to see more shows like it throughout the year. Orang Utan Comics may be a tiny UK publisher but we have a mainstream aesthetic that doesn’t quite fit at a lot of UK shows… so it would be great to see more shows with a focus on the more mainstream side of the comics industry.